Community gardening is expanding in Milwaukee. Last season there were 78 raised bed gardens in Kilbourn Park. This year there are 123. On Memorial Day the Victory Garden Initiative (VGI) held their second annual Victory Garden Blitz and installed more than 100 back yard gardens throughout the city. Hide House Community Garden in Bay View has 110 raised beds. Concordia Garden at Palmer and Concordia has an enormous spread ofbeds, and any number of city-lot gardens – formal and informal – are springingup across the city. Many of those gardens depend on water from city hydrants. Milwaukee Water Works Superintendent Carrie Lewis reports that thepractice of using water from hydrants for community gardens was in place whenshe started in 1997. This spring Milwaukee Urban Gardens (MUG) became the agency that holdscontracts for hydrant use at community gardens. They currently hold 23contracts for the 2010 season. The grand-daddy of community gardening is the Milwaukee CountyCooperative Extension (MCCE) garden plot rental program – 2010 is theirthirty-eighth year. This year they have 12 rental gardens providing morethan 50 acres for cultivation. There are 481 families and groups rentinggardens, involving 1,180 adults and 636 children. These families and groupsfeed more than 2,300 people with the produce they grow. Eight of the 12 gardens depend on hydrants for their water. In December, 2009, MCCE received written notice from the city ofMilwaukee that Milwaukee Water Works (MWW), in conjunction with the MilwaukeeFire Department, established a policy that urban gardeners and landscape firmswould no longer have access to water from hydrants beginning in 2011. After a series of discussions between city representatives and MCCE,the city announced that a set deadline would not be implemented as long ascommunity leadership would work toward identifying and implementing strategiesto eliminate hydrant use for community gardens. It’s just so easy to use water from city hydrants. That’s one of thereasons the proposed policy change is so troublesome to gardeners. MCEE examined installing storage tanks and trucking water to fill them.In addition to the costs for the tanks and installation, the price of gas and environmentalimpact of trucking rather than using piped water must be considered. Teutonia Gardens, a community garden created for a housing developmentat Teutonia and Center Streets, uses water pumped from an underground cisterninstalled to store rain water from the hard surfaces of the parking lot androof of the building. This is a forward thinking idea. It was built into theoriginal design, making it more affordable than a retrofitted structure. It wasthe first of its kind approved by the city, setting a precedent for this typeof installation. This type of cistern is one of the alternatives beingseriously considered by several groups of gardeners in the city. Why does the city want to stop using hydrants as a source of water forcommunity gardens? There are some drawbacks to hydrant use. MCCE’s Johnson commented, “From a garden rental standpoint,the primary problems with hydrants are vandalism of the spigots, use by peoplewho are not gardeners and the inconvenience of when the hydrant is acrossthe street from the garden.” The city forbids running a hose across the streetdue to safety hazards, so some gardeners are forced to carry water in bucketsacross the street. But the city has other concerns. The reason that a garden connection poses a risk is that the hydrant is“live” so the water is immediately available. 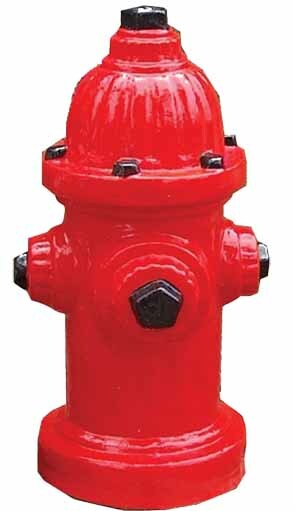 If firefighters need tohook up to a hydrant that serves a garden, they have to turn the hydrant off,disconnect the special garden connection, hook up their hoses and then turn thehydrant back on. Those few seconds could be a fatal delay in a fire emergency. The hydrant being “live” also increases the risk that the cap couldbecome dislodged. Water pressure inside a hydrant is extremely high, and acap could turn into a dangerous missile, resulting in serious injury. “This is a low probability but high consequence event,” SuperintendentLewis points out. The more hydrants are used, the more likely they are to be damaged andmalfunction when needed for fire suppression. “We want to keep use to aminimum,” Lewis said. Everyone who uses water from a hydrant, except for community gardens, isrequired to have and use backflow preventers. These are costly devicesthat ensure that the water supply is safe from contamination by dirty waterflowing back into the general water system. MWW is also trying to improve their “water accountability” byunderstanding where treated water is going and how it is being used. Thisinvolves metering water at as many connections as possible, including hydrants,when permits are granted. MCEE is installing a water meter this summer at the community gardenlocated at 6th and Howard Streets. Costs to date for that projectare more than $6,500, even with an existing lateral to the property. There’s something about gardeners. Maybe it’s all the good food, freshair and exercise. Maybe it’s all the time they spend leaning on their shovelsand talking to each other. Whatever the reason might be, they are a bunch ofproblem-solvers. On April 2 a meeting was held at the Urban Ecology Center. It wasconvened by MCEE, and representatives of MUG, VGI and other interested partieswere also at the table. MCEE Director Eloisa Gomez chaired the meeting, andexplained the city’s concerns and upcoming policy changes. She also reported onresearch into water access alternatives done by UW Milwaukee students and thework that MCEE is doing with US Rep. Gwen Moore to secure federal funding formeter installations at community gardens. – Come up with some short-term solutions for gardeners who currentlydepend on hydrants for their water supply. – Brainstorm long-term solutions for community garden and urbanagriculture water access. A city-wide meeting is planned for Wednesday, July 14, 6pm atIndependence First, 540 S. 1st Street. Gardeners, urban farmers oranyone interested in hydrant use for community gardens is welcome to attend,organizers say. Agenda items include a presentation by city officials to explain thechange in policy, a question and answer period, and a brief presentation onsome alternative water strategies. Community involvement will include smallgroup discussions, brainstorming sessions, reporting back ideas to the largergroup, and plans for next steps. Will Allen of Growing Power says that there are two vital things weneed to build the urban agriculture industry – soil and farmers. Water, it seems, would have to be considered up there as part of a “bigthree” for urban food production. Everyone who has ideas on this issue will have the opportunity to offerthem at the meeting July 14. Come early to meet and greet your friends and fellow gardeners.